Boy, have we got the big ones! And the little ones and the in-between ones. 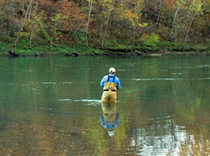 Whether introducing a child to the thrill of fishing, or hoping for a record catch yourself, you need to get away to Beaver Lake and the White River, the premier fishing destinations of northwest Arkansas. The lake and river both offer world-class fishing experiences and record-setting catches. Below the dam, the 52-degree White River is noted for its cold-water fishing of Rainbow, Brown and Cutthroat Trout; White,Walleye. Record-breaking fish have been caught both from wading and by boat in the tailwaters below Beaver Dam. Beaver Lake can be fished for trophy-size Stripers, hybrids (a cross between White Bass and Stripers); White, Smallmouth and Largemouth Bass; Walleye, Catfish, Crappie, and Perch -both Brown and Bluegill. 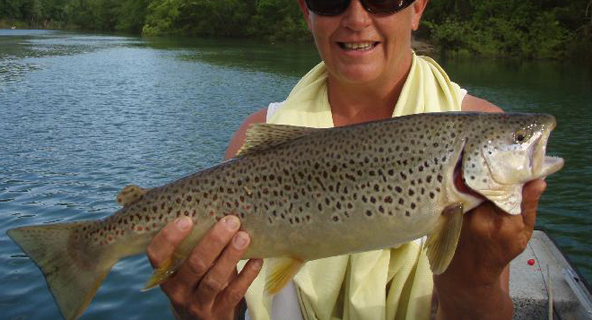 You will enjoy your guided fishing trip from the talented, personable and knowledgeable guides of Eureka Springs West. Your time will be spent surrounded by amazing scenery of woods, cliffs, mountainssuperbly clear water. To make your fishing experience absolutely THE BEST, check with our outstanding guides, all noted for their success in making your trip fun and memorable. A fishing license can be purchased at either Riverview Country Store or Beaver Dam Store. The license is inexpensive and its purchase helps pay for fishery/hatchery management; to protect endangered species; for lake maps and printed guides, and other fishing-related projects. A fishing license is needed by anyone 16 years or older, must be on your person, and cannot be shared with anyone else. 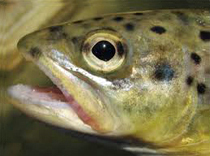 Trout fishing may require an additional permit and there are special rules to be followed. Your fishing guide and the stores mentioned above can explain them, and the rules are posted along the riverbank as well. Looking for beautiful rainbows, cutthroat and brook trout? Or maybe Ozark smallmouth, striped bass, largemouth, and more? 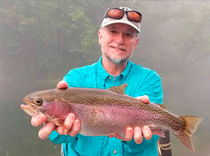 Our guides can offer complete instruction service for beginners or help the experienced fly fisherman learn new techniques. We have exceptionally qualified guides who keep up with the White River’s current conditions, doing everything possible to make sure your guided trip will be the best possible. Both half-day and full-day trips are available. Fishing with Busch Mountain Fishing Guide Service, you will be fishing on a 2018 18' Mako Skiff. Fishing in this boat you will not have to sit in a single file row, like most river boats. You have the freedom to move around and fish in comfort. Have a big family? We can accommodate a family of 5. The famous White River lies on the tailwaters of Beaver Lake, and can provide you with a world of adventures. Known for its cold waters and various species, it is a fishing paradise that includes Rainbow trout, Browns, White Bass and Walleye. 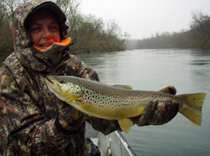 Lisa Mullins is a nationally recognized fishing guide with 30 years of experience in the outdoors and angling. Let her create your guided Adventure! Fishing in Beaver Lake is an experience every fisher-person should have, and we’re just around the corner from the trophy-fish area. There are designated areas especially for fly fishing and bass fishing. We have a trout guide on premise, and the White River is only a short drive from here. You can charter a boat or fish from the banks, and bait and gear are available just down the road. Come and experience a unique time in the fishing Mecca of the Ozarks!